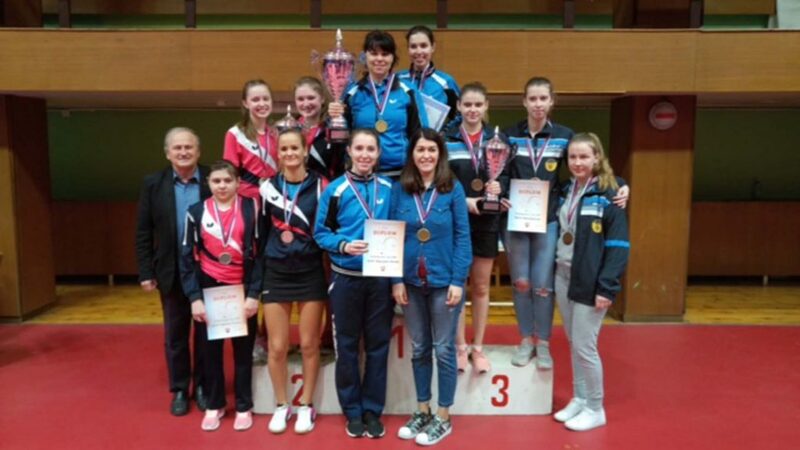 Champions on three previous occasions, SST Euromilk Dunajska Streda increased the number to four by emerging successful in the final of the Slovak Women’s National League in Bratislava on Sunday 7th April. The club emerged victorious in a closely fought final against KST Viktoria Trnava, securing a six-four win; third place was secured by SKST Ruzomberok, they succeeded recording the same measure of success in opposition to STO Valaliky. Hard fought matches are nothing new in any sport, the unusual factor was the composition of the winning team. Marta Daubnerova, bronze medal winner in Women’s Singles 50 to 59 years at the 2017 European Veteran Championship in Helsingborg, lined up alongside daughters Simona Vereska and Andrea Daubnerova. It was the second team national title for the Marta Daubnerova. In 1988, the same year as her daughter Simona was born, in what was then Czechoslovakia, representing Lokomotiva Bratislava, she had emerged successful. Notably it was the first such title for Simona Vereska, a proud mother with a son two and half years old; for Andrea Daunerrova, Cadet Mixed Doubles silver medallist in partnership with Mattias Översjö at the 2006 European Youth Championship 2006, it was her fourth in the colours of SST Euromilk Dunajska Streda. However, as the fixture came to a conclusion, it appeared that the odds were with KST Viktoria Trnava; they led four-three. It was at that stage the tables turned in favour of SST Euromilk Dunajska Streda. Andrea Daubnerova beat Tatiana Kukulkova in three straight games (11-5, 12-10, 11-6) the player who recently qualified for the forthcoming 2018 Youth Olympic Games by emerging successful at the Road to Buenos Aires tournament in Tunisia. Matters level Marta accounted for Danijela Karkusova on her fourth match point (12:10, 11:3, 15:13) before Simona overcome Zuzana Pekova to seal the victory (4-11, 11-7, 11-8, 10-12, 11-6); a unique family success.